Home > Fire Safety & EMS > Safety Signs - Danger Warning Signs > In Case of Fire Use Stairway Sign - Rigid Plastic - 5.5" x 7"
Home > Safety Signs - Danger Warning Signs > In Case of Fire Use Stairway Sign - Rigid Plastic - 5.5" x 7"
Home > Fire Safety & EMS > Fire Safety Evacuation Supplies & Tools > Fire Evacuation Supplies & Tools > In Case of Fire Use Stairway Sign - Rigid Plastic - 5.5" x 7"
Home > Fire Safety & EMS > Fire Safety Evacuation Supplies & Tools > Fire Extinguisher Arrow Signs > In Case of Fire Use Stairway Sign - Rigid Plastic - 5.5" x 7"
Home > Fire Safety & EMS > Fire Extinguisher Arrow Signs > In Case of Fire Use Stairway Sign - Rigid Plastic - 5.5" x 7"
Home > Fire Extinguisher Arrow Signs > In Case of Fire Use Stairway Sign - Rigid Plastic - 5.5" x 7"
In Case of Fire Use Stairway Sign - Rigid Plastic - 5.5" x 7"
These 5.5" x 7" In Case of Fire Use Do Not Use Elevator Signs are silk screened using fade resistant UV inks on rigid plastic. The plastic signs feature pre-drilled mounting holes and clear graphics, perfect for flush mounting on any wall near the elevator. 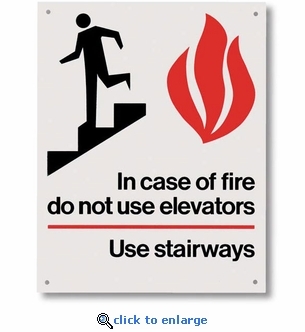 Ensure everyone in your building knows not to use the elevator and to use stairways to evacuate in case of a fire or other emergency. 12 or more qualify for Free Shipping. Orders 40 or more will ship UPS Ground. Exit Sign - Silk Screened on Rigid Plastic - 12" x 8"
Danger No Smoking Sign - Silk Screened on Rigid Plastic - 10" x 8"
No Smoking Sign - Silk Screened on Rigid Plastic - 8" x 10"